This Byzantine wreck was reported to journalist Peter Throckmorton in 1958 by a sponge diver from Bodrum, and was excavated between the years 1961-1964, requiring 3,533 dives. The wreck lay about 32-39 m deep off Yassıada, a small coastal island that caused many ships to wreck in antiquity, and contained a wealth of information about the 7th century A.D. The mapping system, carefully employed by the excavators, provided details about its construction and allowed for a full reconstruction of the ship. It was discovered that the ship was built differently from preceding Greek and Roman ships in that it was more crudely constructed, suggesting that the builders chose economy over aesthetics. Other adaptations include smaller mortise-tenon joints, which means that the hull strength came from the internal framing system, and not from the planking. Thus, the ship appears to have been constructed in a mixed shell-first and skeleton-first way, which places it at an important transitional stage in ship-building technology. Another feature unique to this shipwreck was the tiled galley (cooking area) roof that had a chimney. This cooking area contained water jars, cauldrons, pots, jugs and pitches, a copper bake pan, and even fine tableware with settings for 4 or 5. A storage locker near the galley contained the ships valuables: gold and copper coins, a carpenter’s toolkit, unused lamps, balance weights, and three steelyards, the largest of which was inscribed with the name of the ship’s captain/priest, Georgios. 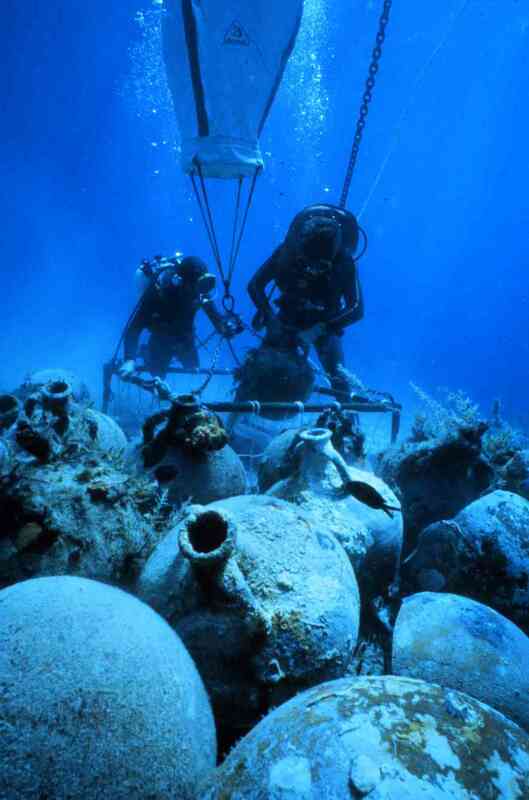 The ship was carrying approximately 900 amphoras, coated internally with pitch, and carrying wine. Some amphoras were inscribed with graffiti, indicating previous uses for the amphoras, such as storing olives or lentils, which suggests that perhaps instead of a coastal wine trader this wreck carried wine in recycled amphoras. Bass, G. F., and F. H. van Doorninck, Jr. 1982. 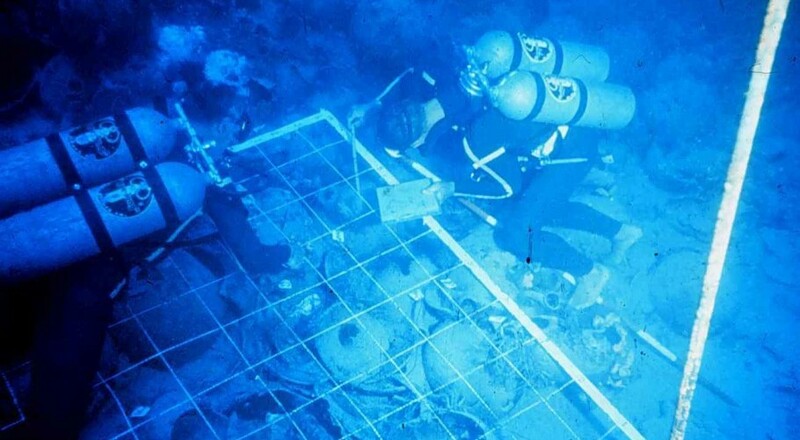 Yassı Ada 1: A Seventh-Century Byzantine Shipwreck. College Station, Texas: Texas A&M University Press. ABOVE: Amphoras being loaded into a lift basket to be transported to the surface (Left Photo: INA YA7-657). 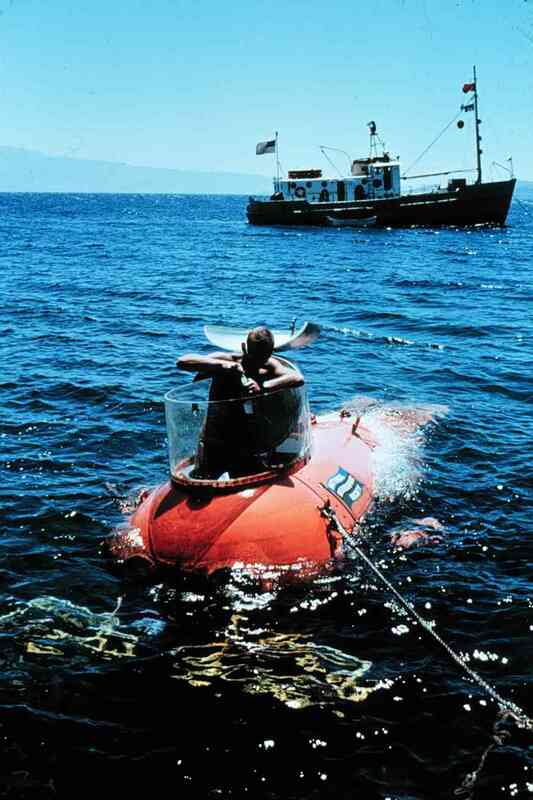 The submarine Asherah in preparation for its descent on the Yassıada site. (Right Photo: INA YA7-131).